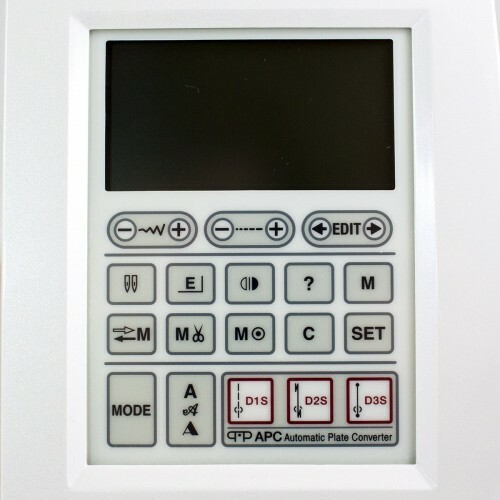 Automatic Plate Converter: Select a straight stitch and the Automatic Plate Converter (APC) changes the size and shape of the needle hole. When the needle is going up and down in a single spot, the needle plate operates best with a single small, round hole. This is especially important when you're using light fabrics, stitching at high speeds or doing free-motion quilting. Your fabric won't be pulled into the needle plate; it stays flat and smooth. Plate Markings: Sewing, and especially quilting, is all about precise measurement. 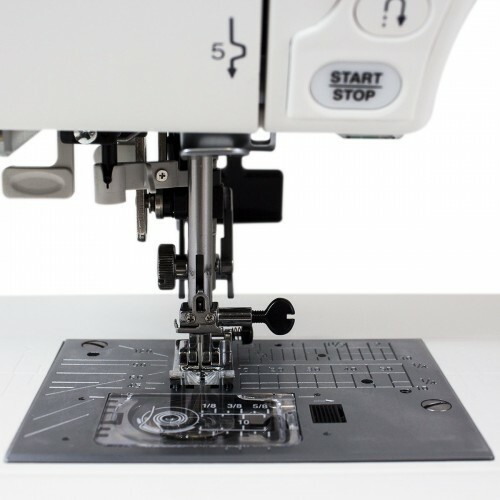 The comprehensive markings on the Janome Horizon's needle plate and bed give you extra precision when and where it counts - right on the plate as you're making your stitches. You'll find markings on both sides of the needle for seams of all sizes. There are also special angle marks, cornering guides and needle drop lines. Superior Plus Feed System: The 7-piece feed dogs of the Superior Plus Feed System (SFS+) move parallel to the needle plate and in unison as they pull your fabric past the needle. This exclusive Janome design, sometimes called a box feed, increases the surface area in contact with the fabric. Combine this with the professional-grade good pressure, and the thickest canvas to the thinnest silk is fed without slipping or shifting. AcuFeed: When it's time to move a lot of layers at once, our AcuFeed System literally pulls it all together. With a wider stance and a more even pull, the AcuFeed foot feeds your top layer(s) of fabric past the needle in precise, parallel coordination with the bottom layer(s). Matching plaids and working with difficult fabrics, like laminate and suede, is frustration-free with AcuFeed. The JNH MC7700QCP is built on the most popular Janome Memory Craft model ever for quilting and sewing. Janome has taken everything that sewists love about the Janome 6600P, added the features they've always wished it had (and thrown in a few more for good measure), and created what will become the most coveted machine in the sewing world! When looking at the Janome New Home Memory Craft 7700QCP, Janome excellence is obvious from the outside - Superior Engineering provides innovative technological advantages. But this exterior quality is reinforced with amazing integrity on the inside. A cast metal frame provides trustworthy support - ensuring your Janome will stand any test. 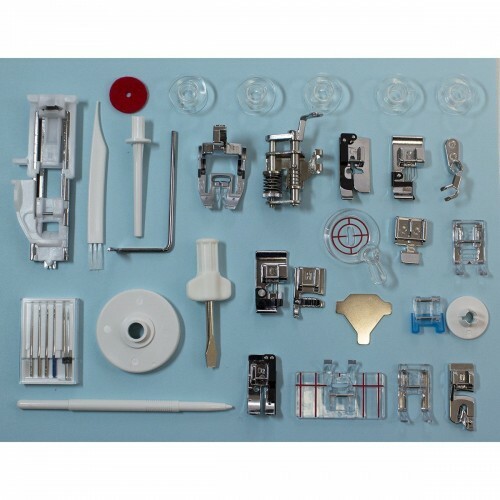 This die cast metal frame is unique in the sewing industry, and sets Janome products above our competition. 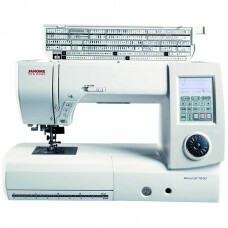 It is the basis for the superior stability and quality of Janome products. 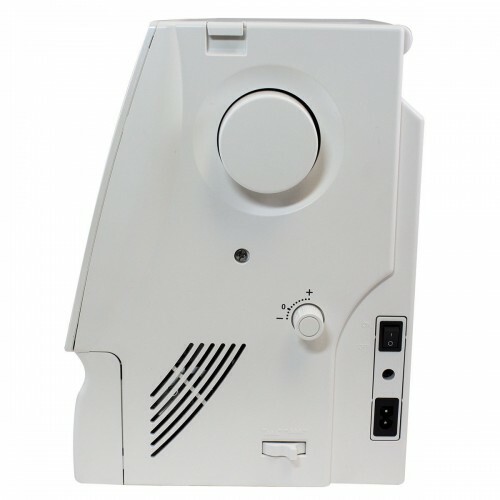 The Janome New Home MC7700 QCP has some eye-opening features! It boasts a free arm. It's the machine you've been waiting for. This is truly the ultimate sewing and quilting machine. A big arm for big projects. This is the longest free arm on a Janome machine. 11-inch x 4.7-inch Work Area. You have more space for big quilts, slipcovers and window treatments. You have to be able to see what you're doing. Good lighting reduces eyestrain so you can sew for hours and not feel tired. The 7700 has 5 ultra bright LED lamps in three locations across the machine. Double Accessory Bins Plus Upper Storage. Lots of places to store all those standard accessories. The AcuFeed system feeds the top fabric layer in perfect sync with the bottom layer. It is effective on everything from thick quilt sandwiches to fine heirloom fabrics. Sew Up To 1,000 Stitches Per Minute. The 7700QCP is fast, sewing a straight stitch up to 1,000 stitches per minute. Yet each seam is made with beautiful accuracy. Whatever speed you choose, you feel in complete control. For intricate work, there’s also a slow start/stop function. Say goodbye to puckering, shifting and slipping. SFS+ is a Janome engineering exclusive. It combines a patented advance cam mechanism with unique 7-piece feed dogs that stay parallel as they move up and down to maintain constant contact with the fabric. This 'flat feed' method has always been standard on the highest level Memory Craft machines. The tradition continues with its inclusion on the JNH MC7700. Activated on three main straight stitch options to create a single round needle hole. Makes straight stitching more precise than ever. Innovative, Patented Needle Plate Markings. More of everything: angles, needle drops, cornering guides and seam lines. Do complex measuring right under the needle. Trims tails to less than half an inch and pulls needle thread to the back. Memorized Needle Up / Down. Save time as you go from seam to seam. It's important for the presser foot to have enough force to keep the fabric from slipping. The 7700 gives you seven levels of professional-grade pressure from which to choose. The 7700 is as solid as a rock, even when sewing at high speeds. Adjustable Knee Lifter Is Standard. Sometimes you need both hands on the fabric when you raise the presser foot. The Knee Lifter lets you raise the presser foot with your knee. The handle adjusts to your most comfortable position. Easily accommodates layers of fabric. Thread your needle with the push of a button. Lockstitch Key For Perfect Finishing. Auto thread tie-off can be programmed into stitch combinations. High Visibility LCD Touchscreen With Stylus. Use your finger to navigate or touch the screen with the stylus. Spin forwards or backwards through your stitch choices. It’s as fun as it is functional. 250 Stitches To Play With. You can choose from 250 stitches, including 11 buttonholes and three monogram fonts. The hundreds of stitches are arranged in 11 groups for easy reference. Typical groups are Heirloom, Quilt, Appliqué, Pictograph, and Play. You'll also find candlewicking, hand-look quilting, and new ribbon border stitches. Save Your Stitches In Twenty Memory Banks. You can combine stitches on your machine to create original designs all your own -- up to 50 characters long. You can even program a lockstitch at the beginning and end. Twenty memory banks provide plenty of room to save them. Retrieve your stitches with ease at the touch of a button. Size decorative stitch combinations to perfectly fit a given space. Super Stable Extension Table Is Optional. Give your project the support it needs. The machine's extension table fits snugly around the machine. The table is extra large for big projects. And its feet are set near the edge for super stability. Simply set the machine's manual Cloth Guide (Optional) to your seam width and save a lot of measuring and marking. It attaches to a track on the back of the bed. It is set using the convenient ruler/scale markings that go all the way up the arm. The Cloth Guide can even be used with the extra wide table (an Optional accessory). 250 Stitches and 20 memory banks. 11-inch x 4-inch work area with an extra long free arm. Navigate via LCD screen or tactile jog dial. Acufeed System moves layers in perfect sync. Quilt Piecing System is an amazing synergy of precision. Full length measuring markings on arm plus needle plate angles, cornering guides and needle drops. 1/4 inch seam foot O. Convertible free motion quilting foot QB-H.
Open toe satin stitch foot F2.